Once inside the towering tunnel of trees the loud city noises become muffled background sounds. The most audible sound comes from the birds twittering around and the wind blowing the tree tops far above our head. After walking the six blocks down Clifton Ave. from Pat’s childhood home we were at the entrance to Scott Woods. This park had back handedly gotten in on the Hawk Island renewal a few years ago. At the very end of Clifton Ave. sits this sentry cove; a beckoning preview of what sits within its treescape. Instead of the old dirt paths and rustic signs it once had the city has paved a walking path wide enough for two way pedestrian traffic. Well built bridges cover the slow flowing streams or even dried up riverbeds. There have been recent additions of directional signs leading walkers to their proper destination; whether it’s to Potter Park, MSU River trail, McGuire Park, the Soldan Dog Park or Hawk Island. Only in location does this new Scott Woods resemble the single file trails leading to a small gravel pit that Pat took me to while we dated twenty two years ago. The old air plane hangar is no longer there. In fact the gravel pit is no longer there. It’s really hard to explain what happened in this area; a landscaping on steroids. Bulldozers brought in piles of dirt, redirected hills and islands and developed a recreational masterpiece. The gravel pit became a gorgeous lake with a picturesque island in the center. Pavilions and picnic tables are scattered in perfect symmetry throughout the park. The community meticulously constructed a playground that can entertain children for hours. (I know this for a fact). 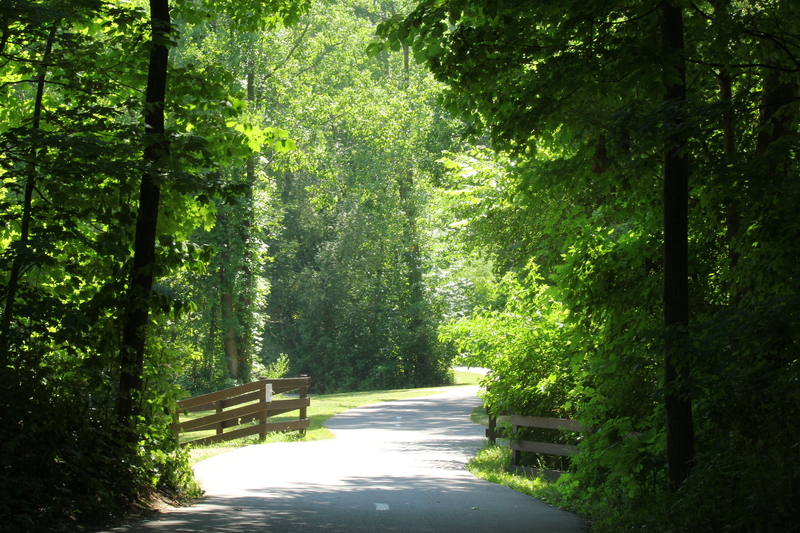 The cemented trail all around the park lends for roller blading, walking, biking and in the winter skiing. Fishing is a common sport in designated areas around the lake. There is also a boating area for enjoying the water without getting wet. 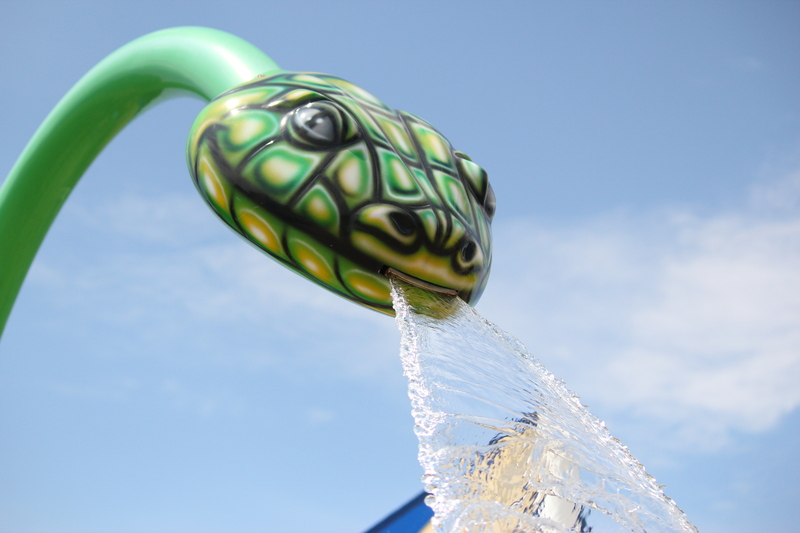 However, if getting wet is your intention, as it was ours on this overly hot day, then the greatest adventure at Hawk Island is the splash pad. We knew we were getting close to the watery play area as we continued our walk. We could see the lake through the trees. The increase in frequency of passing pedestrians also gave us a clue. Then we heard the screaming. It was the constant squealing, giggling, yelling and laughing of hundreds of Lansing residents refreshing themselves in the lake and at the splash pad. It called to us from around the trail. With sweat dripping down our backs we could only hope that we would reach that refreshing water soon. We made the turn onto the trail that took us directly to flowing, crystal clear fountains. We walked past the boat area; we passed the trail to the playground and beach and walked right through the gate to the Hawk Island splash pad. We waded through the clouds of chlorine and suntan lotion and joined the throngs of people that we had just heard screaming in the distance. For the next hour we stood under buckets filling with water, slowly spilling onto our heads. We ran through tunnels of shooting water and stood on holes in the ground gushing water straight into the sky. We used guns to shoot the water and cones to redirect it. It was the hottest day of the year and many were out seeking anything to refresh them and to wash the sweat from their bodies. With these incredibly warm summer days many would have no other way to cool down and definitely not have anything this cool! This entry was posted in Uncategorized and tagged City Saunter, Hawk Island, Lansing, Michigan, parks, Scott Woods, south side, splash pad, water park. Bookmark the permalink.